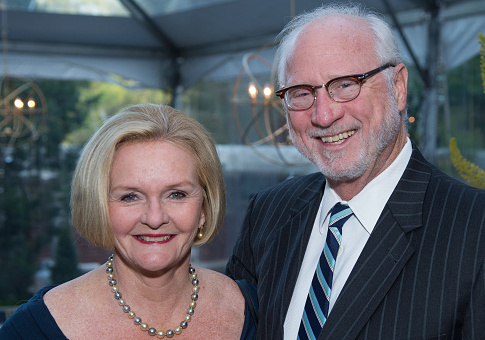 Missouri Democrat Claire McCaskill's reelection campaign responded to a Wednesday report on her husband's $1 million investment in a Cayman Islands hedge fund by pointing to her support nearly a decade ago for legislation targeting offshore tax havens. But congressional records show her name hasn't been associated with the bill since her husband's investment. McCaskill's husband first invested in Matrix Capital Management in 2013 and her financial disclosure forms filed with the Senate show he has earned between $230,000 and $2.1 million in income from the fund since, the McClatchy report revealed. Her campaign responded by saying McCaskill's policy decisions were not "based on what's best for her husband," and that's "why she supported the Stop Tax Haven Abuse Act." McCaskill was one of five cosponsors of the 2009 Stop Tax Haven Abuse Act, according to congressional records, which also show she was the only one of the five to pull her name from the legislation when it was reintroduced in 2011. Her support for the bill remained absent when it was reintroduced in 2013, 2015, and 2017. She also failed to get behind the bill during her first session in Congress in 2007, when the bill was first introduced. McCaskill's campaign did not respond to inquiries into why she pulled her name from the bill and whether it had anything to do with her husband's investments. The legislation aims to make it easier for U.S. law enforcement to identify funds using offshore sites like the Cayman Islands to avoid tax enforcement. Investment funds like Matrix Capital Management base their operations in the United States—Matrix, for example, is listed as a Waltham, Mass., based fund on McCaskill's financial disclosure—but use that base only to feed into an offshore "master fund" that makes the actual investments, according to McClatchy. The campaign told McClatchy that McCaskill has no involvement in her husband's investments. The Washington Free Beacon revealed last week that McCaskill had been using a private plane, which on her financial disclosure forms is listed as one of her husband's assets, on the campaign trail. The Republican National Committee is using the new reporting on McCaskill's offshore financial interests as new evidence of its claim that the two-term senator is out of touch with Missouri. "Claire McCaskill continues to prove just how out of touch she is with average Missourians on an almost weekly basis," said spokeswoman Christiana Purves. "Missouri voters are looking forward to voting this typical ‘do as I say, not as I do' politician out of office in November, and replacing her with someone who will fight for them and their families." McCaskill denied a Kansas City Star request for her to release tax returns for both her and her husband, who file separately. This entry was posted in Politics and tagged 2018 Election, Claire McCaskill, Missouri. Bookmark the permalink.